Use the form to send us an email. We will be happy to answer to your inquiries. VenTex Software Corporation has developed an industry accepted,web based waterflood application program dealing with the immiscible displacement of oil by water resulting in the prediction of oil recovery. This application is not intended as a substitute of state of the art simulation methods but rather as a quick way for the practicing engineer, geologist, operator or other qualified user to predict the performance of oil recovery due to the injectivity of water and to determine project viability. In other words, most of us involved in day to day operations do not have the time and in many instances, the inclination to become specialists in simulation techniques and processes when projects arise a few times each year. The calculations are based on the waterflood predictive methods recommended by various researchers (Craig et al, Caudle & Witte and Welge) that consider the water displacement mechanism including the existence of a saturation gradient behind the water bank ( movable oil ). Layer analysis is initiated with data input consisting of rock and fluid properties usually found and available in most production operation office environments. Relative permeability data obtained from laboratory measurements from cores can be manually input or can be empirically generated if saturation end points and rock wettability can be estimated. The application can be applied to one or more 5 spot patterns and can be used to approximate the behavior of other similar patterns. It is intended for use by practicing reservoir and production engineers, geologists and those technically trained personnel involved in the day to day management of oil fields operations. It is a “hands on” process that most engineers, geologists and operations personnel can use without hours of tutorial study or out of office training. The required data should be readily available in the typical operations office. •	Project summary which contains multiple reservoirs/pattern and hence multiple zones and layers. A report format is available for maintaining hard copy data. The graphics portion of the application allows for plotting performance by individual layer, by zone or by project summary. 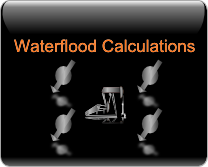 The plotting variables available are those frequently encountered in industry when analyzing waterflood performance. The calculated results by layer, by zone or by project summary consists of cumulative injection, cumulative oil production, water to oil ratio, cumulative water produced, daily injection rate, daily oil rate, daily produced water production and percent surface water cut, all versus time. User defined graphs can also be constructed using any of the aforementioned variables. The results are reported in tabular form as well as graphical and are available at the layer level, by zone or at the project summary level. The project is an excellent precursor to simulation which usually involves much time and cost. Registration is free and fairly simple to complete. SPE monograph volume # 3 “10 Layer composite summary” project is available for review as a default project. You can view all calculations results for this pre-existing sample. You can start using the application at any time and can return to visit your projects all the times you need to enter or complete the data. You can check out layers individually or all layers of the project at once. Review, Analyze, Add and Edit as needed. You can add, edit, clone and delete Layers on existing projects. The price for adding a new layer or cloning from existing one is $ 30. The charge for editing data entry from existing layer is $15. After checkout you can always return to review, print reports or graphics at any time, you are only charged once. Your projects will be kept for one year by default. You can always pin your projects in order to keep them available after the first year.